The legendary amazon swimmer Martin Strel has recently attended 2 international festivals in Europe. First one was Ekotop film festival in Bratislava-Slovakia (Oct 2007), and the 2nd one was Explorers festival in Lodz-Poland (Nov 2007). At both festivals Martin received awards for his amazing swimming feats and for raising an important awareness of clean waters. The award Martin received at the Ekotop Film Festival in Slovakia was called HONOUR OF EKOTOPFILM. In the past years the same award has been given to Al Gore (ex vice president of USA), Jacques Yves Cousteau (legendary environmentalist), Monaco prince Albert and others. See the complete list at the website www.ekotopfilm.sk. 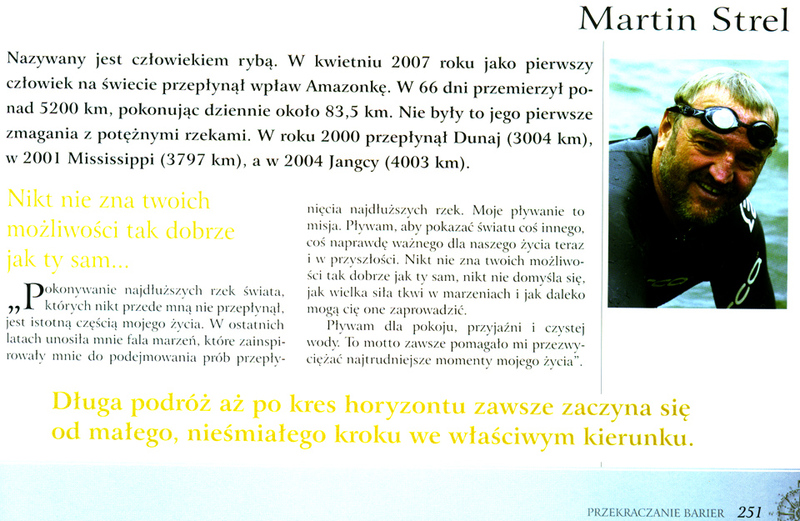 In Poland, Martin was honored with the EXPLORER award. In the past years the same award has been given to Sir Edmund Hilary (mountaineer), Reinhold Messner (mountaineer), Liv Arnesen (polar explorer), Bertrand Piccard (scientist-adventurer), Borge Ousland (polar explorer) and others. See the complete list at the website www.festiwalgor.pl. At both festivals Martin also presented his recent Amazon Swim project. During the festival in Slovakia we were honoured to see the festival´s general sponsor company in Kosice. U.S.Steel Kosice is a giant profitable integrated steel company located in Eastern Slovakia. Thank you organizers for such a great events.